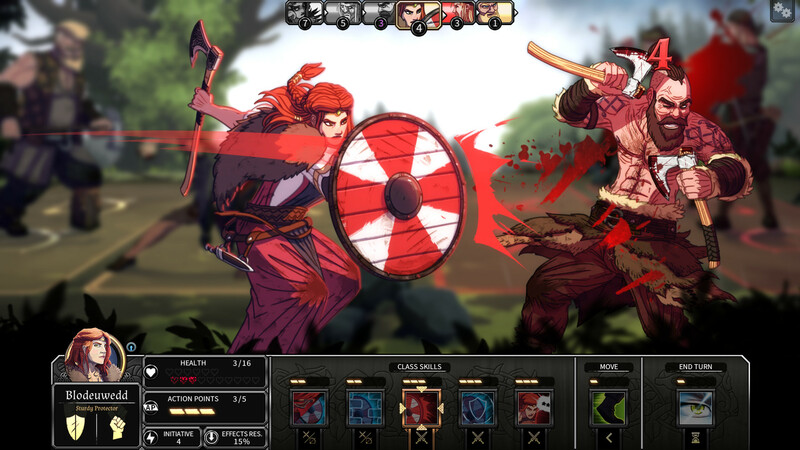 Dead in Vinland Review - Settle, Develop, and Fight to Survive! As what Friedrich Nietzsche once said, “To live is to suffer, to survive is to find some meaning in the suffering”. 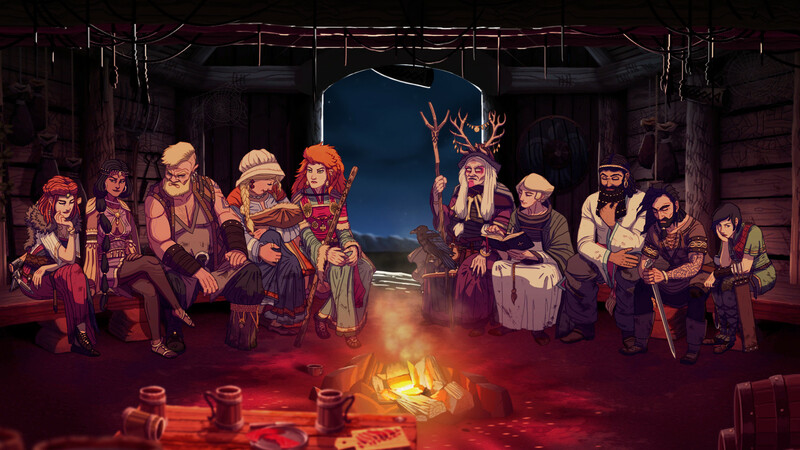 In the case of Dead in Vinland, you have a whole Norse family to deal with. You go through each day trying to figure out why they ended up in this weird hell hole and figure out how they will survive. This review is based on a review code provided by Playdius. 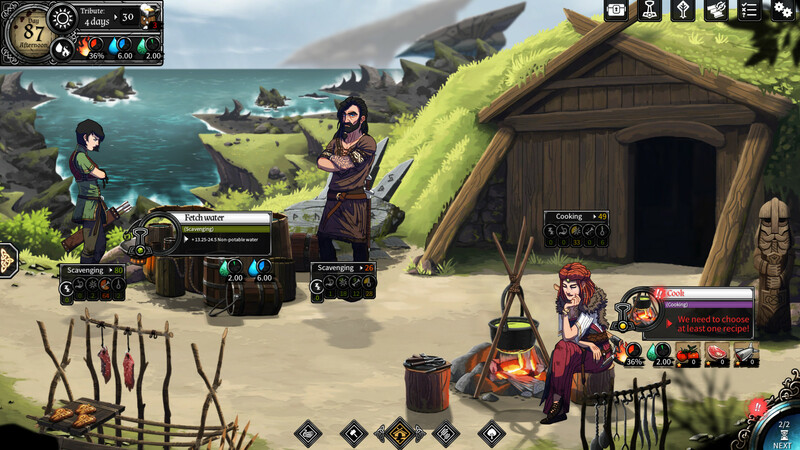 Dead in Vinland is a survival management game with RPG and adventure elements. The “Dead in” part of the name is due to it being the sequel/prequel/spin-off to Dead In Bermuda which is a good game in its own right. It is 2D and much of the game is turn-based. The game gives you a lot of options while you try to make the best of what you’ve got. The story of Dead in Vinland is about a family of Vikings that was ambushed. The family barely manages to escape in a boat. They weathered a storm while out in the sea. When all seemed lost, they landed on the shore of some island. With renewed determination to live, they set out to stay alive no matter what happens. Meet the family. Eirik is the father of the family. Eirik is married to Blodeuwedd. Moira is the sister of Blodeuwedd. Kari is the only daughter of Eirik and Blodeuwedd. These are the initial characters you manage. There will be more characters available as you progress through the story as it is very difficult to survive in a hostile environment. Once you start the game, there are 3 difficulties. Easy, Normal and Hard. They aren’t named that way in the game but it’s easier for readers to understand it as such. 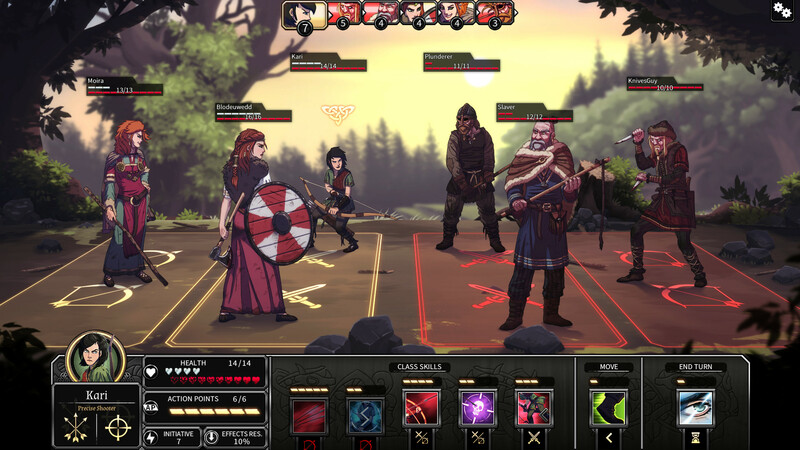 Dead in Vinland also has an Ironman mode, it’s just like in other turn-based games where it doesn’t save after a turn and where you live with the consequences. Turns are based per day. There are 3 phases to a day: morning, afternoon and night. Clicking “Next” will progress time. Morning and afternoon allows your characters to perform tasks. Night is when they talk, eat and rest. Interactions give your other characters buffs or debuffs, so choose wisely! Also, make sure to pay attention to what the conversation is about. There are times when the game refers to previous conversations. If you don’t provide the correct answer, the best case scenario is that your character gets depressed. Worst case is that it will inflict an ongoing debuff on them. You will need to pay attention to them especially during night time because some quests use the information on the conversations. During the morning and afternoon phase, it’s mainly used for gathering and keeping up the requirements. There is also a weather modifier that affects the mood and efficiency of the characters. Do not forget to gather water and wood to make fire. These are the requirements to keep surviving. As you go through the game, you gain stations to help you with survival. You craft these stations using a Workshop. There are some characters that are proficient with certain stations. Take time to read what they are good at. For example, Kari is best at exploring so you should send her to do that. 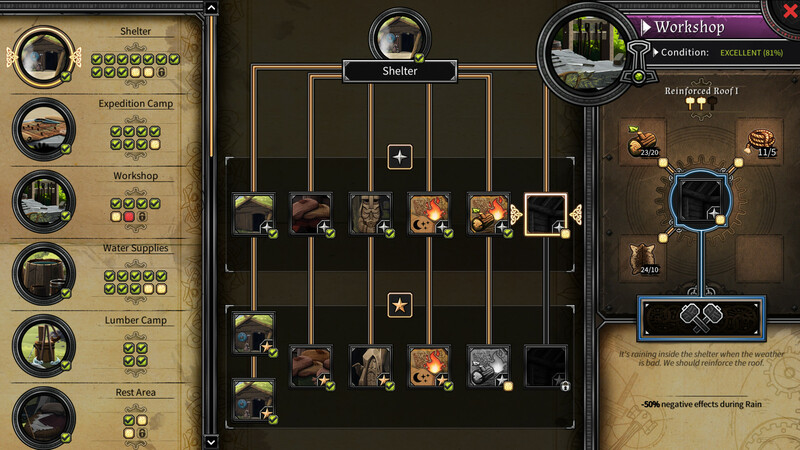 About exploring, every area contains exactly one object that you can click on but many choices on what to do are available. Some actions are limited. You will know because it’s colored in red. Actions during exploration don’t affect time of day. There are a lot of skill checks and you can use any of your characters to complete them. You can do a lot of actions when exploring but reserving/delaying some actions are also a good idea because there are debuffs when you fail. Failures on actions gives random debuffs like sickness. If I could give any advice, get the Tavern. It really helps when there is rain. Most gathering activities inflict depression, so make sure to have a Tavern as soon as possible. Every station deteriorates per day and the lower condition means lower efficiency so repairs are needed once in a while. There are times when you’re forced to send people to do things they aren’t good at. For example, sending Moira to scavenge for water. While she isn’t good at it, she will level up eventually. At night, that’s when they eat whatever you’ve gathered in the morning and drink water. A stat called Dehydration determines how thirsty your characters are. For example, Dehydration 4 will kill them so that’s the furthest you can neglect water. In the beginning, you’re stuck with bad food. Each time you let your characters eat bad food, they feel sick. Bad food will also give you debuffs called Diseases. Diseases are any status debuffs that have a green disease icon. It is also during the Night phase that makes the food rot. Rotten food will become fish bait, so that’s a hint on what station to make early! The combat in Dead in Vinland is precisely my cup of tea. It isn’t flashy. How combat looks has never been the forte of turn-based games. What it does have is the beauty of execution and its well-thought-out skills. In the beginning of combat, you are asked to choose which characters you will bring. One thing to take note of is the initiative of every character. It will tell you if your character shoots first. 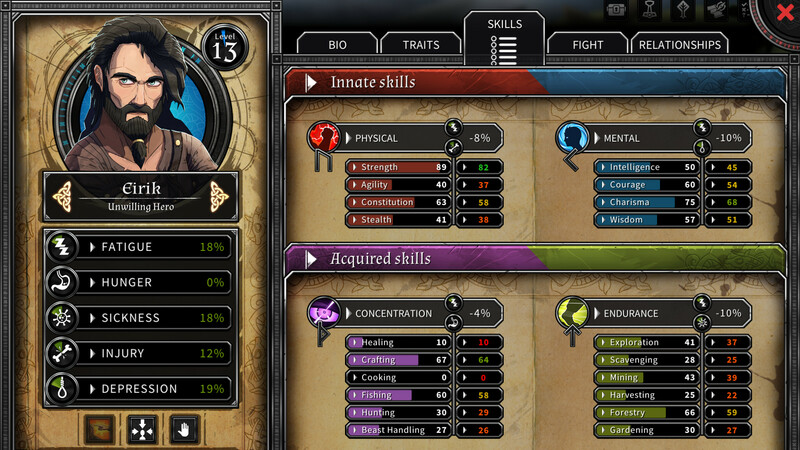 The interface also tells you which characters are warriors and which characters don’t deal damage. Each character also has a different skill set. For example, Kari uses bows so she usually stays at the back. Blodeuwedd does a lot of tanking. Eirik is your melee damage and Moira does buffing and debuffing. Each skill has a certain distance. Each skill also consumes Action Points or AP. Ending your turn early will award you 1 AP. Combat is pretty easy after two or three rounds into the fight. The guide within the game is very informative and easy to understand. Enemies scale well so the fights get harder and harder the longer you progress into the game. Each character has gray hearts, this is the amount of damage that a character can take before incurring injury. Sometimes, they get bad debuffs such as Wounds. Bandages remove Wounds. These are any status debuff that has a blood icon. As much as possible, you don’t want your enemies taking away your red hearts. Each character can only have a specific amount of injury, or else (you guessed it!) death. It’s a good idea to get a Healing Tent so you can get rid of these nasty debuffs. I found it weird that there were no keyboard shortcuts. I guess, it’s because each character’s speed may change depending on the combat but I’d like to press 1 for the first skill, 2 for the second and so on. There are many ways to play this game. I spent 9 hours straight on my first play through. I was devastated on my first character death. Take note, there are many characters to meet too! As the number of in-game days go on, the more layers I discover about the whole game and the more hooked I become. The music is pretty great. I loved that it stuck to the Viking theme. The combat music effects were good and they weren’t annoying. If there was one thing that I would want added, it would be great to have some voiced scenes where the characters would grunt or gasp. Those are really small things but they are nice touches during conversations. At first, I didn’t really like the art style. However, it grew on me as I kept playing. It was a good contrast to the background. I also realized how expressive the faces were and the attention to detail it had for all the characters that you unlock. I liked the transition effects between the different times of the day and the effects during combat. About the banter between your characters, it’s as mature as you can get. It’s not truly ye olde English and not boring either. I can see how some people will get offended but it’s all about how you play the game! I love how the decision making is crucial to all aspects of the game, being it during combat, during harvesting, gathering, exploring, everything! I just hope that they make an option to skip the first cut scene and fast forward through scenes you have unlocked or read before, just like in visual novels. Dead in Vinland is fun, engaging, complex and totally worth your money.